Fancy getting a mate for your fish? Try adding this bubbling crab fish tank ornament to your tank, and see how crabs and fish can get along just fine! Why are bubbles so great? 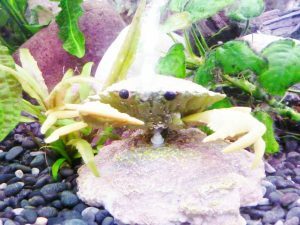 Many fish love playing in bubbles, and adding an ornament like this crab could provide your fish with hours of entertainment. Also, adding bubbles to your fish tank can create an oxygen flow, which can please fish. And everybody wants happy fish! If that wasn’t good enough, bubbles can actually help get rid of any nasty smells lurking about the fish tank. It’s a win for everyone (unless you like stinky fish tanks. In which case, seek help). This crab is fish friendly and very well made. Take a look! As with all of the fish tank ornaments on my site, don’t just take my word for how brilliant I think they are. Even though I have an awesome opinion! Or at least that’s what my mum says. I still recommend that you take a look at some recent reviews and comments for the product, don’t just take my word for it.